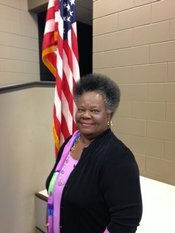 Theresa Ann Locke, Ozark native, is a retired Department of Army civilian, with extensive experiences in military education and training programs. She received the Bachelor of Science Degree from Alabama State University and the Master of Education Degree from Auburn University. She is also a graduate of the Army Management Staff College and holds graduate certification in Distance Education from Indiana University and the University of Wisconsin. She was appointed to the School Board in June 2016. She plays active roles in her church, school alumni and sorority working with youth and promoting scholarship opportunities.